The Byer of Maine Micro Strap is a modified cinch buckle system that incorporates both tree-friendly webbing with a highly-adjustable suspension system in one. The straps are 1 in (2.5 cm) wide and 9 ft (2.7 m) long. One one end of the strap a loop is sewn that is used to connect the strap around the tree or anchor point. The opposite end is the toggle connector and adjustable buckle. Having the buckle slider so near the hammock means there is more adjustability available in the suspension system. The cinch buckle is not your garden-variety hardware. The slider is easier to adjust and is wider for better handling. An elastic keeper loop helps to hold the unused portion of the webbing from dragging onto the ground. The overall construction is very high, with strong box and cross stitching and tucked seams. 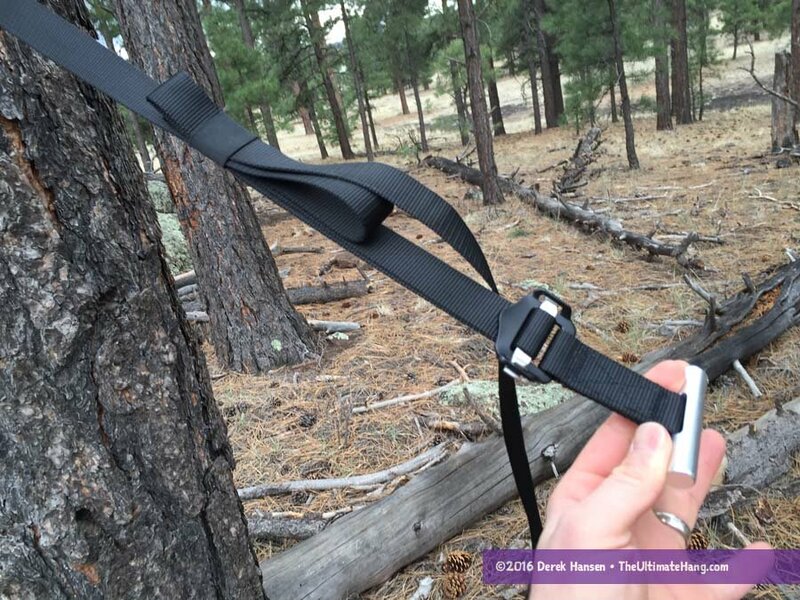 These straps efficiently combine not only the protective tree webbing and adjustability, but also a connection point. In other words, you don’t have to go out and by or use any extra hardware such as a carabiner to connect your hammock to the straps. This is an important feature of the Micro Straps, but it also means that a little extra weight is built into the strap by design. This strap set is actually a good alternative for beginners who are looking for a fairly easy suspension system that will work with a wide-variety of hammocks. This strap system works best with hammocks that use a continuous loop on the ends of the hammock. What I really like about the straps is the toggle because it means I can quickly attach or detach the hammock from the suspension. Some cinch buckle systems either wrap the buckle direction onto the hammock’s end loop or have the webbing semi-permanently attached to the hammock. Either of these methods have not appealed to me for a variety of reasons. I like the modularity of having a plain end loop on the hammock so I can use other suspension systems as needed. Construction and Craftsmanship ♥ ♥ ♥ ♥ ♥ These straps are “bomb-proof.” The buckle is not your run-of-the-mill buckle; it is more robust and easier to adjust than the garden variety seen on most cinch buckle systems. Adjustability and modularity ♥ ♥ ♥ ♥ ♥ Since the buckle is so close to the toggle, there is a lot of adjustability available. The toggle makes it easy to attach to any hammock. Price and Value ♥ ♥ ♥ ♥ ♥ This is a well-made product that uses high-quality parts, construction, and machining; well-worth the price. Thank you for using a rating system, it is soooooo much easier to see what you really feel about the product. Thanks for the feedback. I’m definitely exploring its usefulness, so I appreciate your thoughts. I may go back and add this rating to older reviews to provide consistency and context. This looks like a good system to build on; do you think it would be useful for some crazy hangs (i.e. large trees in conjunction with a hammock-mounted whoopie? Do you think the whoopie would place too much point stress on the toggle? The toggle is solid. I have no worries about it with any suspension system. 9 feet for the straps aren’t Ling enough for me. Think I could just substitute my straps for the 9 footer? You could always extend it with more webbing.